The Star Citizen team is now seeking input on what to do with the next truckload of money it brings in. I look forward to the day when I can write "Star Citizen is done!" but until that magic moment arrives I'll have to be content with noting the seemingly endless piles of money the game has been able to attract through crowdfunding. In the latest "Letter From the Chairman," Roberts Space Industries CEO Chris Roberts says the funding total has now surpassed an insane $35 million, thereby unlocking the final fan-voted ship design: the Drake Herald. 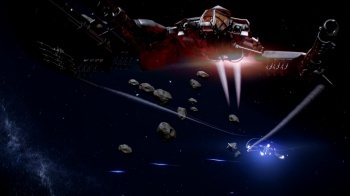 "Whether it's colonists struggling to stay in contact with the UEE's central worlds or criminals trading in illicit data, there will always be a need to securely move data. The Drake Herald, a small, armored ship, is designed to fit that need and safely get that information from Point A to Point B," the update states. "Featuring a powerful central engine (for high speed transit and generating the power needed for effective data encryption/containment), advanced encryption software and an armored computer core, the Herald is unique among personal spacecraft in that it is designed to be easily 'cleaned' when in danger of capture. The Herald includes an array of heavy duty internal options for data protection, including redundant power subsystems and EMP shielding, and a high-powered broadcast array for data transmission." Roberts also revealed that the winner of the $37 million stretch goal poll is the "stellar graveyard" of the Tanga System, a "rectangular planetary nebula" boasting two worlds that once supported life but are now dead and lifeless, the result of the system's red giant star collapsing into a white dwarf. With that out of the way, RSI has opened a new poll, the results of which will be implemented if the game reaches $38 million.